How hungry is India and why? India keeps a pretty low place in most development indexes. In the world’s Human Development Index (HDI) India ranks at 131 out of 168 countries ranked, and is in the company of all other South Asian countries except Sri Lanka (73). Sri Lanka is better placed than even China, which is ranked 90. Only Kerala can be compared to Sri Lanka. In terms of Infant Mortality Rate (IMR) for less than 5 years, India is 126 out of 175 countries ranked. The real sting in the IFPRI listing was the suggestion that India fell precipitously by 45 places since 2014, which is when the Modi regime came into being. The inference is correct, but the truth is something else. The truth is India dropped from 97 to 100 out of 116. That puts us in our long accustomed place in the development rankings across the board. The big difference was due to a new method of display used to put out the rankings. Till 2016, India used to be ranked in a separate list of worse off – hunger wise-countries. There used to be a separate list of better off countries. In 2016 the two lists were amalgamated into one and hence we appeared to have plummeted down by 45 places, incidentally after Modi regime began. Modi got pilloried, particularly in social media, on the basis of an incomplete truth. Something that he is quite adept at using himself. So I don’t particularly feel sorry for him. 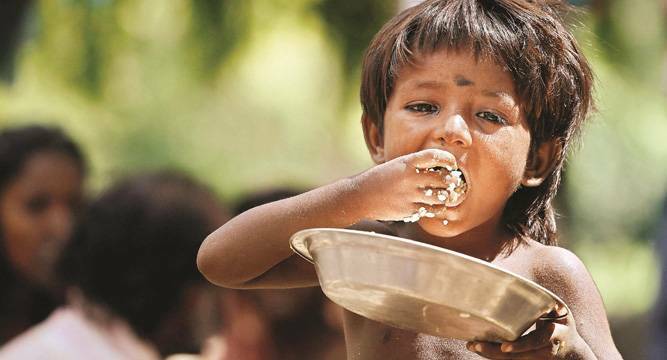 Hunger in India is not a consequence of not producing enough food. It is a consequence of many people not having enough money to spend on food, sometimes even for bare sustenance. Total foodgrains production in India reached an all-time high of 251.12 million tonnes (MT) in FY15. Rice and wheat production in the country stood at 102.54 MT and 90.78 MT, respectively. In the mid-60s India was forced to import 10 MT of foodgrains and that was just enough to feed all the people. Despite its falling share of GDP, agriculture plays a vital role in India’s economy. Over 58 per cent of the rural households depend on agriculture as their principal means of livelihood. Census 2011 says there are 118.9 million cultivators across the country or 24.6 per cent of the total workforce of over 481 million. In addition, there are 144 million persons employed as agricultural laborers. If we add the number of cultivators and agricultural laborers, it would be around 263 million or 22 percent of the population. More than 65 per cent of the farmland consists of marginal and small farms less than one hectare in size. Moreover, because of population growth, the average farm size has been decreasing. The average size of operational holdings has almost halved since 1970 to 1.05 ha. Approximately 92 million households or 490 million people are dependent on marginal or small farm holdings as per the 2001 census. This translates into 60 per cent of rural population or 42 per cent of total population. Food production is at record levels. Nevertheless people are still going hungry. The problem is apparent. The small size of the average holding does not leave much more than bare subsistence. As holdings are getting smaller, the number of landless keeps increasing. But our system has just not been able to provide enough jobs. Since there is such an obvious oversupply of labour, wages are depressed. The average wages in the growing service and construction sectors is usually well below the minimum prescribed by the government. Is it any wonder then that families often starve or are pretty close to the starvation line? Our poverty level is a calorie intake based level. The idea of defining poverty in terms of a poverty line was first proposed during the Indian Labor Conference in 1957. A Working Group under the Planning Commission then stipulated a poverty line of Rs 20 per person per month. They derived this poverty line using consumer expenditure data and a caloric norm. The understanding was that anybody spending less than this amount is poor because he or she does not have the purchasing power to buy enough food that met the caloric norm. The present official poverty line is based on the norm that the average person in rural India should be able to consume 2,400 calories and the average person in urban India should be able to consume 2,100 calories. According to a committee headed by former Reserve Bank governor C. Rangarajan, there were 363 million people, or 29.5% of India’s 1.2 billion people, who lived in poverty in 2011-12. The Rangarajan panel considered people living on less than Rs 32 a day in rural areas and `47 a day in urban areas as poor. In my 2005 study ‘Redefining Poverty’, I opined the present ceiling on poverty was so low that even if the government were to hand out enough money to each poor family to buy enough food to be just above the official poverty line, it would only cost around Rs 57,000 crore per year. It might be a bit more now, but still eminently affordable. That is why I favor a Universal Basic Income scheme wherein every BPL household gets a minimum threshold of monthly transfer of cash, in lieu of the plethora of hugely porous subsidy and social welfare schemes, which mostly benefit the millions of government functionaries. Since poverty or starvation or hunger is mostly a consequence of the inability to earn enough, hunger must be viewed as a colossal economic failure that still blights almost 30% of all Indians.